Nicolás Maduro announced on Monday that he would sit down with members of the opposition for a meeting which would be a precursor to talks, to be mediated by a mission of ambassadors from a South American regional bloc. 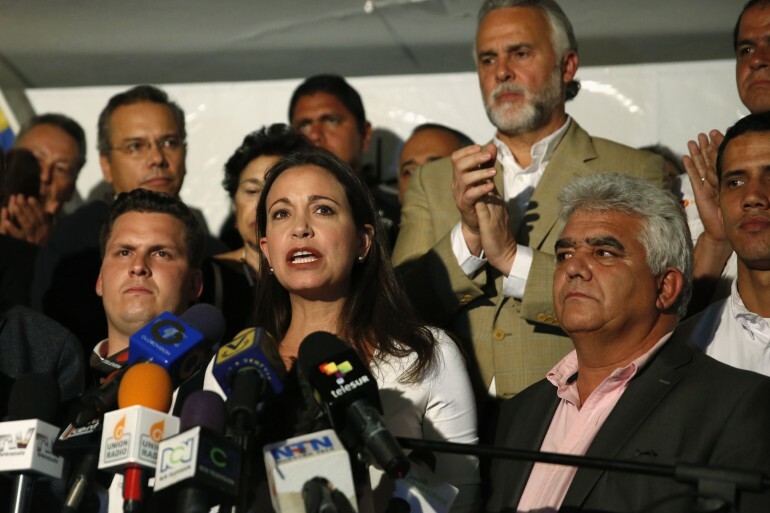 Some opposition leaders who agreed to attend said they’d been assured that Maduro’s government would discuss their four demands for talks, which include the unconditional release of detained opposition lawmakers, the creation of an independent commission to assign blame for violence, and the disarmament of grassroots Chavista groups. But not everyone in the opposition is ready to even talk about talks. María Corina Machado, the conservative lawmaker and fierce antagonist of Maduro’s government who was once a favorite foil of late president Hugo Chavez, said on Tuesday that she would have nothing to do with talks to “stabilize the dictatorship” of President Nicolás Maduro, according to El Tiempo. “There cannot be dialogue with students, mayors and Leopoldo López behind bars and as long as repression exists,” Machado wrote on Twitter, referring to the one-time conservative mayor of a Caracas district who is facing well over a decade behind bars for his involvement as an organizer of protests. Machado added that she had met privately with South American ambassadors, with whom she “explained [her] position on the situation in Venezuela”. Those who have agreed to attend the preliminary meeting on talks are three top lawmakers with the Democratic Unity Roundtable, a coalition of center-left, centrist and center-right opposition parties: Lara state governor Henry Falcón, party secretary Ramón Guillermo Aveledo, and one-time governor and current assemblyman Omar Barboza.